School board members Jill Fincher, second from right, and Vanessa Sanburn, far right, discuss concerns surrounding bullying, safety and mental health with community members during the Lawrence school district's Community Conversation event Thursday, Dec. 14, 2017. The public event, which encouraged parents, staff and other stakeholders to discuss education issues with school board and district representatives, was held at the Lawrence Public Library, 707 Vermont St.
Around 50 people filled the Lawrence Public Library’s auditorium Thursday night for a public discussion on challenges facing the Lawrence school system. The Community Conversation took place nearly a year after the district hosted its first event, which came after a tumultuous semester dominated by talk of racial equity and drew hundreds to Lawrence High School’s cafeteria. Race and other overarching equity issues were once again the focus Thursday night, along with concerns ranging from bullying and mental health services to curriculum and limited classroom resources. 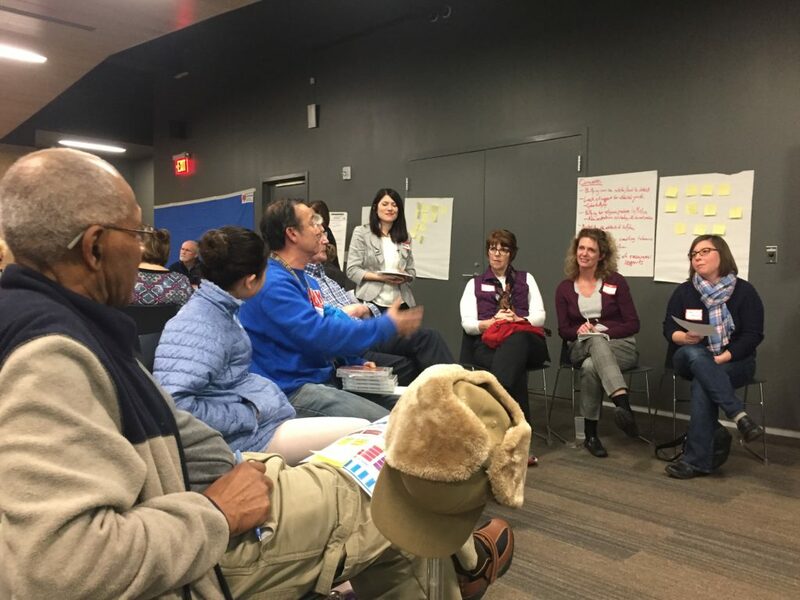 The event, facilitated by the University of Kansas Center for Community Health and Development, had school board members leading group discussions around these key issues. After about 30 minutes of discussion, each discussion group shared its main points with the room. Lori Greenfield, a parent and teacher in the Lawrence district, was quick to join a group discussion on bullying, safety and mental health. “I don’t think we do enough of that early intervention,” said Greenfield, who teaches second grade at Prairie Park Elementary and feels strongly that schools should be proactive in preventing bullying among their youngest students. “On the flip side, I don’t think we do enough for the victims,” Greenfield said, adding that her own son felt uneasy returning to school after a recent bullying incident. Vanessa Sanburn, who led the group with fellow school board member Jill Fincher, agreed that combating bullying should be prioritized. However, she said, limited state funding to address such concerns makes it a challenge. And traditional disciplinary methods, such as expulsions and suspensions, haven’t proven effective in addressing the root problem, she said. “I think as a district we’ve done a really good job with positive behavior supports, recognizing that we need to teach appropriate behavior and we need to highlight what people are allowed (to do), as opposed to constantly looking through a punitive lens and punishing students when they step out of line,” Sanburn said. Continuing that plan and also moving toward restorative practices — “allowing students to mess up, to have alternative options,” Sanburn said — may be part of the district’s efforts in the future. “We all agree that suspension and expulsion are bad ideas, but we also have to recognize that we need to have ways to hold people accountable and to allow people to repair when they do things that are harmful or wrong to other students,” she said. Restorative justice programs, which have been successfully implemented in schools across the country and nearby in the Wichita school district, challenge students to resolve conflicts on their own through peer-mediated small groups. The Lawrence-based Justice Matters collective has lobbied to introduce similar practices in local schools, and earlier this year, staff at Liberty Memorial Central Middle School began its own restorative justice pilot program. School board member Jessica Beeson told community members Thursday night that she’d like to see these initiatives “woven in with” the district’s existing Beyond Diversity training and Ci3T system of student support. It’s already happening, she said, but very slowly. A report shared last month with the Lawrence school board revealed students of color continue to be disciplined with out-of-school suspensions at a higher rate than their white classmates. Though the district is making progress in reducing the number of out-of-school suspensions doled out, efforts to address the disproportionate suspension rate between students of color and their white peers haven’t been as successful. Other recent reports show that students of color still trail their white counterparts in academic achievement and are underrepresented in gifted and advanced-placement courses. The district is working to address this through several methods, including the introduction of culturally relevant teaching and professional training that breaks down misconceptions that some argue lead to students of color being punished at dramatically higher rates. In response, Beeson encouraged Gao to look up the term “institutionalized racism,” which she said the district has been actively combatting for years now through its equity work. Anna Stubblefield, the district’s interim superintendent, said notes from Thursday’s event would be compiled and put to use in organizing the next Community Conversation. Stubblefield said the next event would take place sometime in the spring semester.